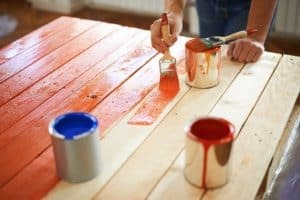 Whether you’re repainting a piece of wooden furniture or painting a newly built item, wood that will be painted must be cleaned, sanded, and primed. Before beginning any project, make a comprehensive plan. It’s worthwhile to invest in quality products and tools. Don’t be tempted to skip steps. The hours you save now may cost years of service. As with any project, getting everything properly prepared is critical for success. Painting wood is a wonderful experience, so get ready to enjoy yourself. You need to decide which paint technique you want to use and what materials and tools are needed. The tools you select will be determined by the materials you choose. One of the most important choices involves whether to use water-based (latex) or oil-based products. Primer, paint, and sealant must be compatible. For example, an oil-based primer would be selected for an oil-based paint and sealant. While oil-based products offer advantages, they require special care including adequate ventilation. Mineral spirits or paint thinner is needed to clean tools. 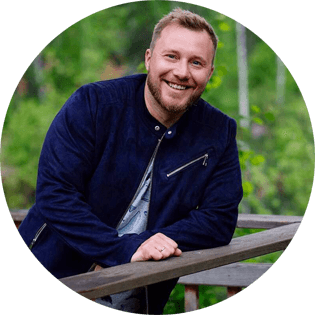 You will discover it’s a good idea to have a separate set of tools for use with oil-based and water-based products because oil and water really don’t mix. It’s important to understand how different products perform. For instance, shellac protects against stains the best but has a strong odor. Water-based primers may not protect against staining. The choice also depends on the kind of wood being painted. Once you’ve made your selections, be sure to read and follow directions. These are chemicals and require special care. You must be vigilant and protect yourself, people nearby, and the area in which you are working. 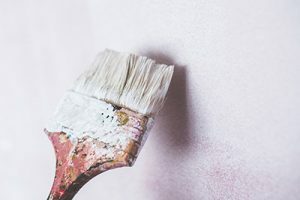 It’s best to complete a painting job (priming, painting, and sealing) as a single process. If that’s not possible, it’s not advisable to delay more than a week between priming and painting. Wood must be clean before primer can be applied. With fresh wood, it’s a simple matter of lightly sanding the wood to ensure a smooth surface. Before applying primer, repair any damage. There are products that can repair cracks, dents, holes, and any other imperfections. If you’re repainting something, you’ll need to sand the wood or apply a solvent. Remember to remove any hardware. You can use painter’s tape to protect areas you don’t want to be painted. It’s important to sand between steps to remove unwanted particles. If a piece requires heavy sanding or stripping, a coarse sandpaper, with 40- to 60-grit, is needed. Sandpaper with 80- to 120-grit is good for surfaces with minor imperfections. 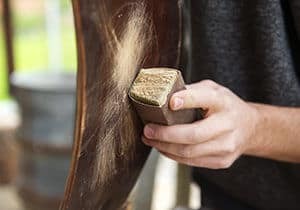 Fine sandpaper, 360- to 600-grit, is used for sanding between coats and to provide the smooth surface necessary for applying primer, paint, and sealant. For the best results, each coat should be followed by sanding with fine sandpaper. After sanding, the resulting dust should be cleaned from the wood. A damp cloth or old paint brush is sufficient for a water-based primer, but a tack cloth is needed for an oil-based primer. A tack cloth is made with a “tacky” material that attracts the sawdust. Prime any wood surface you intend to paint. Primer helps to hide stains, knots, smoke damage and more. Wood is porous, so it absorbs paint unevenly. Primer evens the wood grain, so the surface is smooth. Check best wood primers so that you can choose the right one for you. Another feature of primers is that they prevent bleeding through. Bleeding occurs when the tannins in the wood move to the surface. Tannins are the acidic chemicals that are part of the liquid sap. They are responsible for the different hues in wood. These are an advantage when staining wood but can damage the paint. 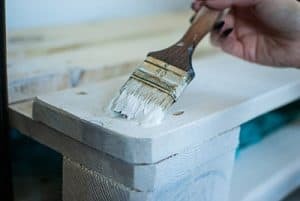 If you’re repainting a piece of furniture, you should consider applying an undercoat instead of a primer. This will seal any remaining old paint, so the new paint will not be adversely affected. If you have made repairs, the primer will help hide these repairs. It’s not a good idea to leave a primed surface unpainted. If the wood isn’t primed, the paint will likely peel or have other unpredictable problems. So choosing a good primer for wood is important. One or two coats of primer are sufficient. Make sure the primer dries completely before painting. There is a technique to paint depending on the material being painted and the tools used. If you decide to use a brush, purchase a good quality brush, or it will shed bristles. Bristles that aren’t coarse are a better choice for furniture. Choose the best size and one that’s comfortable in your hand. It’s worthwhile to invest in smaller tools that will be easy to handle while painting. Undoubtedly, to get the best results you need the best paint for wood. Don’t load too much paint on the brush. Brush with the grain, in complete strokes, from edge to edge, where possible. Brush in only one direction. Light strokes help eliminate the appearance of brush strokes, so don’t exert too much pressure. Two light coats of paint are better than trying to save time by applying one heavier coat. When starting to paint with a dry brush, you can prepare it by running water over it. Use paint thinner if you’re using an oil-based paint. This will make cleaning the brush easier. When cleaning a brush, remember to reshape it. It’s helpful to store the brushes by hanging them, bristles down, when they’re not in use. 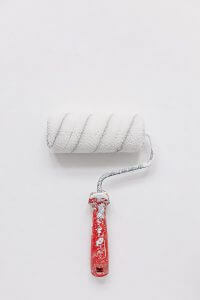 Another tool that can be used to apply paint is a roller. Smaller rollers are available for use when painting things like furniture. A cheap roller will cause problems. Invest in a roller covered in a good material like wool. Any material will shed. One way to avoid this is to cover the roller with masking tape. Pulling it off will remove most of the excess threads. A light touch will reduce visible roller marks. Don’t be tempted to use pressure to get the last paint off the roll. However, running a roller that’s almost dry, lightly across the surface, will reduce marks and help eliminate excess paint. To save time, storing a brush or roller, properly, can allow you to skip cleaning every day. Placing the brushes and rollers in a sealed, plastic bag and putting the bags in the refrigerator will keep them moist. This is particularly useful when using oil-based paint because they’re more difficult and time-consuming to clean. Spray painting is an alternative to using a brush or roller. Once you’ve developed the proper technique, it eliminates the appearance of brush strokes and roller marks. Proper ventilation is a good idea. It’s also easier to clean up. An appropriate type of paint must be used. For example, paint that works on metal won’t work on wood. An exterior paint is a poor choice. For wooden furniture, a satin or semi-gloss finish is a better choice. Some level of gloss will make it easier to clean. A flat paint will show every mark and bit of dirt. You don’t want the paint to get too thick. Penetrol is used with oil-based paint to keep it fluid and more manageable. Floetrol is for use with water-based paint. Avoid painting in an area with a fan or in direct sunlight, and stay away from heater vents. That kind of environment will cause the unused paint to thicken. You can use a spray bottle that will create a mist that can be used to control the moisture in the paint on the brush and in the pan. There are many interesting finishes and ways to “age” a piece of furniture. Some of the more popular finishes include whitewash, stencil or raised stencil, aged copper, antique, antique silver, aged patina, faux verdigris, faux marble, or jeweled tones. A search on these terms will yield a large variety of interesting ideas that will let you create a truly unique piece of furniture. Several coats of paint will improve the appearance. Make sure the paint is completely dry before applying a sealant. You can “distress” paint with things like vinegar and Vaseline, or you can create a weathered appearance. Time and use are not friendly toward the painted wood. However, there’s something that can be done to make sure the job will look great for years to come. The process is called sealing. The sealer is transparent and actually ‘seals’ the paint or bare wood making it smooth and nice. Also, it will let topcoat (finish) stick to the sealed wooden surface more evenly. So the wood will continue to look beautiful. The proper sealant will enhance the paint and make it look like a professional job so it’s important to choose one of the best wood sealers on the market. A sealant isn’t treated the same as paint. It may be lightly stirred, but you don’t want to risk creating bubbles. Gently tap off extra sealant on the edge of the can. Make the brush strokes, edge to edge, to create a uniform appearance taking care to avoid bubbles and drips. The last step is finishing your wooden project. The finish or topcoat is some kind of final covering that protects your wood. You may skip this step if your wood will not be undergoing some considerable exposures. Otherwise, let’s see what option you could choose. Polyurethane can be brushed or sprayed on. In addition to being used with paint, it can be used to achieve a finished look on bare wood. As an oil-based product, it has a powerful odor that requires it be used in a properly ventilated area. It presents a problem if a piece needs refinishing. You can’t strip it by using a solvent. Instead, it must be physically removed by sanding or scraping. Paste waxes aren’t brushed on. They are rubbed into the wood with a rag. Care must be taken to not leave extra wax on the surface. It becomes shiny when buffed. They can provide a unique finish because they’re available in colors. Because they’re soft, they don’t react well to warmth. Furniture finished with a paste wax shouldn’t be left in sunlight. It’s a good idea to reapply this kind of sealant as often as yearly. Interestingly enough, it can be used after the application of a polyurethane sealant for a warmer look. Polycrylic is water-based. It’s low-VOC (volatile organic compounds) makes it useful in protecting children’s furniture. Don’t be concerned because this sealant looks whitish when wet. It becomes clear when it dries. A special approach to finishing a piece, called decoupage, can be used to achieve an artistic look that can be used for small items like picture frames, awards, or jewelry boxes. Once you’re finished with everything, the wood needs to have a chance to completely harden, and that takes time. It can take as long as a month. Doing this will make sure your work looks good a lot longer. If you’ve chosen an aged or distressed look, this is probably not a concern. Take the time to evaluate the experience. That will let you apply lessons learned to your next project. Now, there’s just one more thing to do. Enjoy using your newly painted, beautiful piece of furniture.